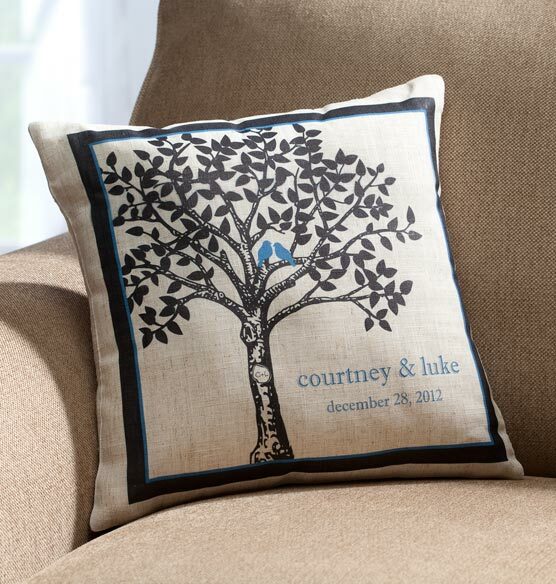 Celebrate the love that blossoms between you with a personalized pillow that delights in your happily ever after. Love birds rest in the branches of the tree, where below your initials are "carved" into the trunk. 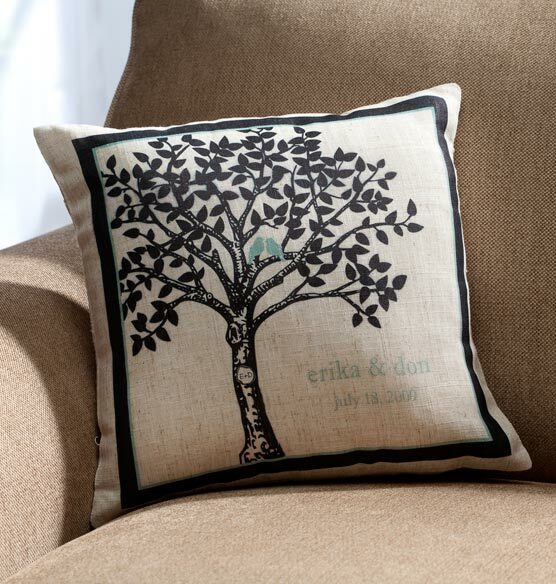 Alongside the tree rests both you and your significant other's first names along with your anniversary date. Select colored accents in your choice of blue, coral, or turquoise. This perfectly colored accent custom pillow makes the perfect addition to your bed or settee. It would also make a thoughtful wedding gift for the happy couple. 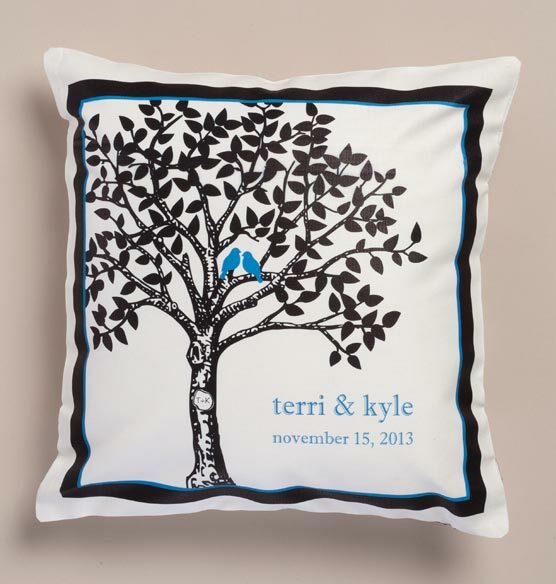 Personalized pillow measures 14" x 14"
The Gift for an Anniversary! I always try to shop ahead for future gifts and occasions. This pillow caught my eye as a nice gift for my son and daughter-in-law's anniversary in August. It is of good quality and very attractive. Ordered this as a wedding gift. It's beautiful. The quality is top-notch. Again, quick shipping. Very happy with this purchase. This was ordered as a bridal shower gift - and I am too embarrassed to give it. It is NOT as pictured! It doesn't even look like a pillow. Size as described is wrong. I ordered a pillow for an a %)th Anniversary present and it was very nice. I was looking for something more personal and this is not an item found in stores. It is nearly the same as the shower invitation for my brother and his fiancee. 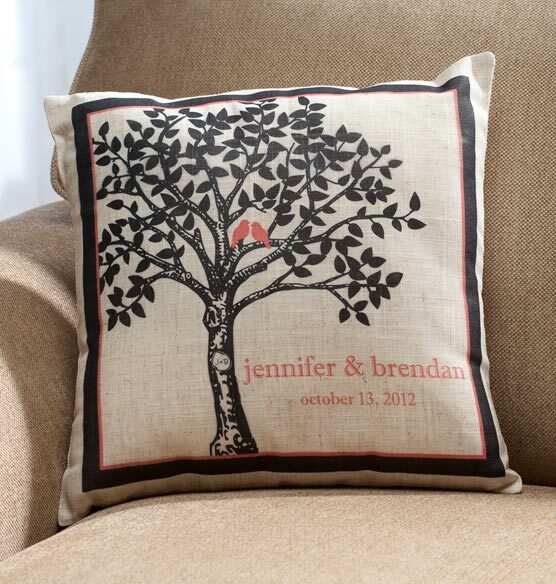 My daughter recently got married and I like the personalization of this sweet pillow! I am going to a wedding of two women and I thought that this pillow (and some other gifts) would be perfect! For my In Laws 50th Anniversary, Hope the love it. Such a lovely and unique design, not the standard "happily ever after". It is simple and understated. I like the colors. This will make a great "cotton" (2 year) anniversary gift! It would also be great for a bridal shower, engagement party or wedding! A personalized wedding gift that I hope the recipients will enjoy for a long long time. I wanted to send a wedding gift to a relative who lives in Europe. I needed something simple, yet memorable, to fit their tastes. This appears to be the perfect fit. Is there any way to make personalization for parents 50th anniversary? BEST ANSWER: Thank you for your question. The information we ask for must be included. Instead of a date they were married you can use 50th Anniversary as this fits. We hope this information will be of help to you.